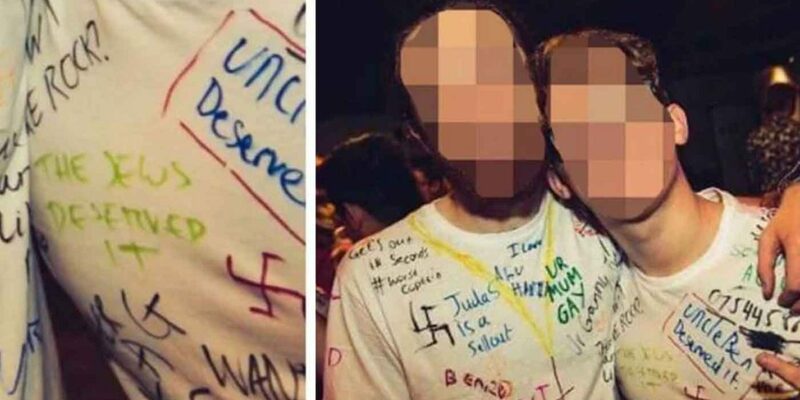 Two Coventry University students are being investigated by the university after they were pictured wearing t-shirts with racist comments and symbols, including swastikas and the words “the Jews deserved it”. The messages on the t-shirts were likely written by others. It is common to have white t-shirt parties where people wear white and other people write messages on their t-shirts. The photographs were taken at Empire, a nightclub in Coventry, on February 6 before being uploaded to the nightclub’s official Facebook page. The images – which also show one man wearing a white T-shirt with “Judas is a sell-out” written on it, and an upsidedown cross – were later reported to the university by the Jewish Society. A spokesperson for the university said: “We have immediately suspended the club while we look into the matter. “We do not tolerate anti-semitism or any form of hate crime. We are deeply concerned about this matter. The Coventry University Jewish Society told student news site The Tab: “We were shocked to see such hurtful and hateful antisemitic language written on the shirts of our fellow students. “It’s unbelievable for students to think appropriate to draw Swastikas paired with ‘the Jews deserved it’ on their T-shirts and think nothing is wrong. “The systematic murder of six million Jews is no laughing matter and this incident shows a lack of education surrounding the events of 70 years ago. “We expect both the Students Union and the University to take appropriate action which at the very least will send a message that no form of Antisemitism will be tolerated. “We have been in contact with the SU who are offering support to our members and taking our concerns seriously.